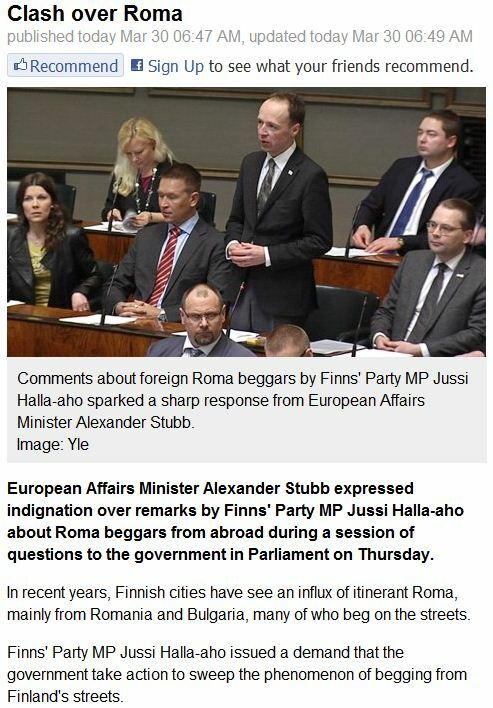 CLASH OF WORDS IN FINNSH PARLIAMENT OVER ROMA BEGGARS IN HELSINKI STREETS……. – The Tundra Tabloids……. CLASH OF WORDS IN FINNSH PARLIAMENT OVER ROMA BEGGARS IN HELSINKI STREETS……. Everyone knows that it’s organized begging. Moving in mass from far away Hungary to far north in Finland to stand or sit there on the sidewalk with a cup in hand, makes no monetary sense, especially when everyone is aware of the extremely high cost of living here. Alexander Stubb (National Coalition, ”CINO”) is an idiot. Previous Post Previous Post THE NEWEST WEAPON: TALIBAN TARTS……..
Next Post Next Post BILL MAHER AND ‘DR.DREW’ WALLOW IN SELF HATRED BASED IN CRITICAL RACE THEORY…….